Electronics Costs > How Much Does a Laptop Hinge Repair Cost? How Much Does a Laptop Hinge Repair Cost? A laptop hinge repair will, unfortunately, be needed when the laptop hinges break, have become overly stiff, become useless holding the weight of the screen, or have broken free of the mounts. Hinge failure is a common issue that can affect all laptop brands, regardless of the materials being used and the price. The metal hinges may physically break or may detach from the plastic parts they are mounted to. The problem usually reveals itself when the LCD bezel becomes broken or is being pushed out. When left untreated, the hinges are no longer able to hold the screen, usually resulting to only one side being attached to the unit. Broken laptop hinges are fairly common problems but can be fixed quickly with the right parts and experience. How much does laptop hinge repair cost? 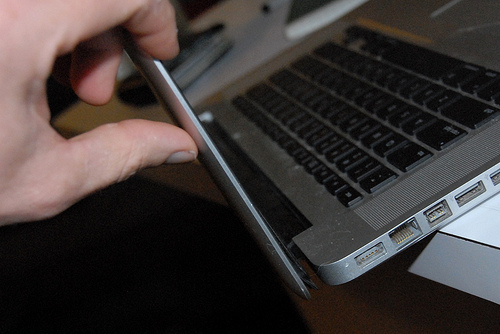 On average, repairing the hinges on a laptop, when hiring a professional, can cost $50 to $200. It will greatly depend on the laptop you own and the professional you hire. Absolute Computers, a computer repair company based in Raleigh, North Carolina, says most of their laptop hinge repairs are often in the $89 to $129 range, but the costs can vary depending upon the cause of the failing hinge. Those who want to do the job on their own should expect to pay around $20 to $50 for the parts. Most laptop models come with individual hinges that, when need to be repaired, may have to be ordered before they are fitted. On some laptops, the hinges may not be too expensive or difficult to find. Others may cost more because of the price of the parts, if the laptop were old, or the amount of work that needs to be done. Hinges are typically replaced in both the left and right sets. The hinge sets may include the actual hinge attached to the bottom part of the laptop and the hinge rails that hold and secure the screen. On average, hinges can cost $7 to $50 a set for the just the parts. The cost to repair laptop hinges will vary between repair centers. Laptop hinge repair services for simple repairs can cost about $40 to $90, but the costs can significantly increase, up to $150 or more when the job involves replacing not just the hinges but also the screen back, the front bezel, and if the special brackets need to be customized. Some providers provide the services for a flat rate, while others quote hourly rates based on the complexity of the job. A laptop hinge repair service commonly involves taking the laptop screen assembly apart as well as the appropriate parts that need to be repaired or replaced, such as the hinges and the plastic casing components. In some cases, a new screen back may be needed on top of the new laptop hinges. Laptop hinges are typically attached to the frame of the computer by means of machine screws. To help ensure that the hinges work properly, inspect them periodically. See if the machine screws that hold the hinges are completely tightened. Obtain replacements from the manufacturer if you see screws are missing. Avoid lubricating the hinges as this can cause damage to the case of the laptop or the fluid may seep into the electrical parts of the unit and bring about more damage. Make sure to ask the professional you hire if they use genuine brand new laptop hinges. Likewise, ask about the warranty provided along with the service and what aspects are covered. Some providers offer a one-year warranty on all hinges and 90 days warranty on all labor performed. It is not a good idea to only replace one hinge. You want them to be even so that the wear evenly. Get free estimates from various repair centers to know how much they are going to charge. Most are able to offer an estimate in person or even over the phone as long as you know your laptop’s exact model number and brand. See if your laptop is still under warranty. If it is, you may be able to get it replaced at no charge. Learn how to do the repair on your own. Most parts, such a hinge, can cost as little as $40 on websites like eBay, and the repairs, even though it may sound scary, isn’t that hard. If the repair is going to be more than $200, you are going to have to ask yourself if the repair is going to be worth it. Today, many great laptops can be purchased for as little as $400. See if the repair is even worth it. With great laptops retailing for less than $500, it may be wise to scrap the laptop and sell it for parts.